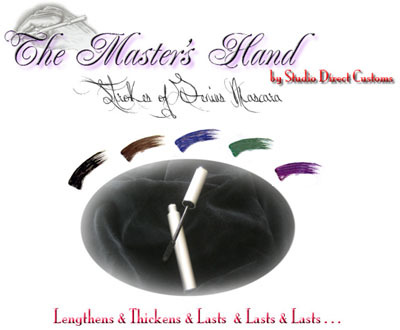 Studio Direct Cosmetics Features Mascaras and Lash Tints for every purpose. Our newest product, Indelible Waterproof Mascara, has extreme staying power and creates Long Runway Looking Lashes. Long & Luscious mascara is designed to lengthen lashes without clumping and open up the eyes. Our Curling Lash Mascara is formulated specifically to curl lashes and add rich color. Thickening & Volumizing Mascara with Keratin is a long wearing, smudge proof volumizing mascara which creates thick and full lashes. Lip Ink Lash Tint is a semi permanent lash tint that does not add any length or thickness. Please review our mascaras and choose the best mascara for your special needs. Create Thick & Full Lashes with our Volumizing Mascara. Long Wearing & Smudgeproof! Once you use an eyelash comb with Metal teeth, you will throw out all your Plastics ones!! Our Mascara Spoolie is recommended for fixing clumps and perfectly separating lashes.